I highly recommend reading the book “Where Wizards Stay Up Late”, which covers much of the history that this article touches upon. Great book. The Kindle version + Audible upgrade is nearly always cheaper than Audible alone. Not sure why. I read the Audiobook version of this book. It presents a narrative of the development of the very early stages of the internet. I enjoyed it. I think it would also have been fine in print or ebook formats. It is not too long and seems to present the events in a mostly linear fashion. You'll get a great overview of the names, organizations, and machines that were used in this period. You're definitely wrong about phones. In 2002-5, Palm was shipping a variety of Treos, which even at the time were clear early-adopter smartphones. Plenty of other companies were investigating the market and shipping early experiments. So if you're going to use the past to predict the future, please at least use some actual past, rather than one you make up to justify your notions. I read Levy's "Hackers..." in 2015 and also strongly recommend it. 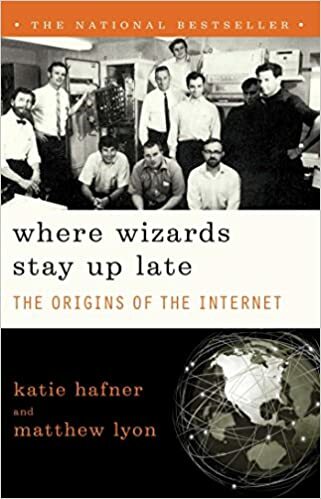 I also recommend "Where Wizards Stay Up Late: The Origins of the Internet" , which ties in to a lot of the same stories. Al gore invented the Web Site.